Not to be confused with miliaria. A vaccine against malaria called RTS,S, was approved by European regulators in 2015. It is undergoing pilot trials in select countries in 2016. ^ a b GBD 2015 Mortality and Causes of Death, Collaborators (8 October 2016). "Global, regional, and national life expectancy, all-cause mortality, and cause-specific mortality for 249 causes of death, 1980-2015: a systematic analysis for the Global Burden of Disease Study 2015". Lancet. 388 (10053): 1459–1544. doi: 10.1016/s0140-6736(16)31012-1. PMC 5388903. PMID 27733281. ^ a b c d e f g h i Nadjm B, Behrens RH (2012). "Malaria: An update for physicians". Infectious Disease Clinics of North America. 26 (2): 243–59. doi: 10.1016/j.idc.2012.03.010. PMID 22632637. ^ a b Worrall E, Basu S, Hanson K (2005). "Is malaria a disease of poverty? A review of the literature". Tropical Health and Medicine. 10 (10): 1047–59. doi: 10.1111/j.1365-3156.2005.01476.x. PMID 16185240. ^ a b Greenwood BM, Bojang K, Whitty CJ, Targett GA (2005). "Malaria". Lancet. 365 (9469): 1487–98. doi: 10.1016/S0140-6736(05)66420-3. PMID 15850634. ^ a b c d e Bartoloni A, Zammarchi L (2012). "Clinical aspects of uncomplicated and severe malaria". Mediterranean Journal of Hematology and Infectious Diseases. 4 (1): e2012026. doi: 10.4084/MJHID.2012.026. PMC 3375727. PMID 22708041. ^ a b Taylor WR, Hanson J, Turner GD, White NJ, Dondorp AM (2012). "Respiratory manifestations of malaria". Chest. 142 (2): 492–505. doi: 10.1378/chest.11-2655. PMID 22871759. ^ Korenromp E, Williams B, de Vlas S, Gouws E, Gilks C, Ghys P, Nahlen B (2005). "Malaria attributable to the HIV-1 epidemic, sub-Saharan Africa". Emerging Infectious Diseases. 11 (9): 1410–19. doi: 10.3201/eid1109.050337. PMC 3310631. PMID 16229771. Archived from the original on 2011-06-29. ^ Beare NA, Lewallen S, Taylor TE, Molyneux ME (2011). "Redefining cerebral malaria by including malaria retinopathy". Future Microbiology. 6 (3): 349–55. doi: 10.2217/fmb.11.3. PMC 3139111. PMID 21449844. ^ a b Hartman TK, Rogerson SJ, Fischer PR (2010). "The impact of maternal malaria on newborns". Annals of Tropical Paediatrics. 30 (4): 271–82. doi: 10.1179/146532810X12858955921032. PMID 21118620. ^ Rijken MJ, McGready R, Boel ME, Poespoprodjo R, Singh N, Syafruddin D, Rogerson S, Nosten F (2012). "Malaria in pregnancy in the Asia-Pacific region". Lancet Infectious Diseases. 12 (1): 75–88. doi: 10.1016/S1473-3099(11)70315-2. PMID 22192132. ^ Mueller I, Zimmerman PA, Reeder JC (2007). 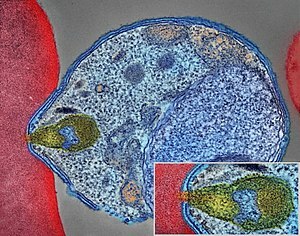 "Plasmodium malariae and Plasmodium ovale—the "bashful" malaria parasites". Trends in Parasitology. 23 (6): 278–83. doi: 10.1016/j.pt.2007.04.009. PMC 3728836. PMID 17459775. ^ a b Collins WE (2012). "Plasmodium knowlesi: A malaria parasite of monkeys and humans". Annual Review of Entomology. 57: 107–21. doi: 10.1146/annurev-ento-121510-133540. PMID 22149265. ^ a b Sarkar PK, Ahluwalia G, Vijayan VK, Talwar A (2009). "Critical care aspects of malaria". Journal of Intensive Care Medicine. 25 (2): 93–103. doi: 10.1177/0885066609356052. PMID 20018606. ^ Baird JK (2013). "Evidence and implications of mortality associated with acute Plasmodium vivax malaria". Clinical Microbiology Reviews. 26 (1): 36–57. doi: 10.1128/CMR.00074-12. PMC 3553673. PMID 23297258. ^ Arnott A, Barry AE, Reeder JC (2012). "Understanding the population genetics of Plasmodium vivax is essential for malaria control and elimination". Malaria Journal. 11: 14. doi: 10.1186/1475-2875-11-14. PMC 3298510. PMID 22233585. ^ Collins WE, Barnwell JW (2009). "Plasmodium knowlesi: finally being recognized". Journal of Infectious Diseases. 199 (8): 1107–08. doi: 10.1086/597415. PMID 19284287. ^ Cowman AF, Berry D, Baum J (2012). "The cellular and molecular basis for malaria parasite invasion of the human red blood cell". Journal of Cell Biology. 198 (6): 961–71. doi: 10.1083/jcb.201206112. PMC 3444787. PMID 22986493. ^ Owusu-Ofori AK, Parry C, Bates I (2010). "Transfusion-transmitted malaria in countries where malaria is endemic: A review of the literature from sub-Saharan Africa". Clinical Infectious Diseases. 51 (10): 1192–8. doi: 10.1086/656806. PMID 20929356. ^ Markus, MB (2011). "Malaria: Origin of the Term "Hypnozoite"". Journal of the History of Biology. 44: 781–86. doi: 10.1007/s10739-010-9239-3. PMID 20665090. ^ Markus, MB (2018). "Biological Concepts in Recurrent Plasmodium vivax Malaria". Parasitology. doi: 10.1017/S003118201800032X. PMID 29564998. ^ Markus, MB (2017). "Malaria Eradication and the Hidden Parasite Reservoir". Trends in Parasitology. 33: 492–95. doi: 10.1016/j.pt.2017.03.002. PMID 28366603. ^ a b White NJ (2011). "Determinants of relapse periodicity in Plasmodium vivax malaria". Malaria Journal. 10: 297. doi: 10.1186/1475-2875-10-297. PMC 3228849. PMID 21989376. ^ a b Tran TM, Samal B, Kirkness E, Crompton PD (2012). "Systems immunology of human malaria". Trends in Parasitology. 28 (6): 248–57. doi: 10.1016/j.pt.2012.03.006. PMC 3361535. PMID 22592005. ^ a b c Bledsoe GH (2005). "Malaria primer for clinicians in the United States". Southern Medical Journal. 98 (12): 1197–204, quiz 1205, 1230. doi: 10.1097/01.smj.0000189904.50838.eb. PMID 16440920. Archived from the original on 2011-05-14. ^ Vaughan AM, Aly AS, Kappe SH (2008). "Malaria parasite pre-erythrocytic stage infection: Gliding and hiding". Cell Host & Microbe. 4 (3): 209–18. doi: 10.1016/j.chom.2008.08.010. PMC 2610487. PMID 18779047. ^ Richter J, Franken G, Mehlhorn H, Labisch A, Häussinger D (2010). "What is the evidence for the existence of Plasmodium ovale hypnozoites?". Parasitology Research. 107 (6): 1285–90. doi: 10.1007/s00436-010-2071-z. PMID 20922429. ^ Tilley L, Dixon MW, Kirk K (2011). "The Plasmodium falciparum-infected red blood cell". International Journal of Biochemistry & Cell Biology. 43 (6): 839–42. doi: 10.1016/j.biocel.2011.03.012. PMID 21458590. ^ Mens PF; Bojtor EC; Schallig HDFH (2012). "Molecular interactions in the placenta during malaria infection". European Journal of Obstetrics & Gynecology and Reproductive Biology. 152 (2): 126–32. doi: 10.1016/j.ejogrb.2010.05.013. PMID 20933151. ^ Rénia L, Wu Howland S, Claser C, Charlotte Gruner A, Suwanarusk R, Hui Teo T, Russell B, Ng LF (2012). "Cerebral malaria: mysteries at the blood-brain barrier". Virulence. 3 (2): 193–201. doi: 10.4161/viru.19013. PMC 3396698. PMID 22460644. ^ Kwiatkowski DP (2005). "How malaria has affected the human genome and what human genetics can teach us about malaria". American Journal of Human Genetics. 77 (2): 171–92. doi: 10.1086/432519. PMC 1224522. PMID 16001361. ^ a b Hedrick PW (2011). "Population genetics of malaria resistance in humans". Heredity. 107 (4): 283–304. doi: 10.1038/hdy.2011.16. PMC 3182497. PMID 21427751. ^ Weatherall DJ (2008). "Genetic variation and susceptibility to infection: The red cell and malaria". British Journal of Haematology. 141 (3): 276–86. doi: 10.1111/j.1365-2141.2008.07085.x. PMID 18410566. ^ Manguin, Sylvie; Foumane, Vincent; Besnard, Patrick; Fortes, Filomeno; Carnevale, Pierre (July 2017). "Malaria overdiagnosis and subsequent overconsumption of antimalarial drugs in Angola: Consequences and effects on human health". Acta Tropica. 171: 58–63. doi: 10.1016/j.actatropica.2017.03.022. PMID 28356231. ^ Orish, Verner N.; Ansong, Joseph Y.; Onyeabor, Onyekachi S.; Sanyaolu, Adekunle O.; Oyibo, Wellington A.; Iriemenam, Nnaemeka C. (October 2016). "Overdiagnosis and overtreatment of malaria in children in a secondary healthcare centre in Sekondi-Takoradi, Ghana". Tropical Doctor. 46 (4): 191–98. doi: 10.1177/0049475515622861. PMID 26738767. ^ Yegorov, Sergey; Galiwango, Ronald M.; Ssemaganda, Aloysious; Muwanga, Moses; Wesonga, Irene; Miiro, George; Drajole, David A.; Kain, Kevin C.; Kiwanuka, Noah (2016-11-14). "Low prevalence of laboratory-confirmed malaria in clinically diagnosed adult women from the Wakiso district of Uganda". Malaria Journal. 15 (1): 555. doi: 10.1186/s12936-016-1604-z. PMC 5109652. PMID 27842555. ^ Abba K, Deeks JJ, Olliaro P, Naing CM, Jackson SM, Takwoingi Y, Donegan S, Garner P (2011). Abba K (ed.). "Rapid diagnostic tests for diagnosing uncomplicated P. falciparum malaria in endemic countries". Cochrane Database of Systematic Reviews (7): CD008122. doi: 10.1002/14651858.CD008122.pub2. PMID 21735422. ^ Kattenberg JH, Ochodo EA, Boer KR, Schallig HD, Mens PF, Leeflang MM (2011). "Systematic review and meta-analysis: Rapid diagnostic tests versus placental histology, microscopy and PCR for malaria in pregnant women". Malaria Journal. 10: 321. doi: 10.1186/1475-2875-10-321. PMC 3228868. PMID 22035448. ^ Abba, Katharine; Kirkham, Amanda J; Olliaro, Piero L; Deeks, Jonathan J; Donegan, Sarah; Garner, Paul; Takwoingi, Yemisi (18 December 2014). "Rapid diagnostic tests for diagnosing uncomplicated non-falciparum or Plasmodium vivax malaria in endemic countries". Cochrane Database of Systematic Reviews. 12: CD011431. doi: 10.1002/14651858.cd011431. PMC 4453861. PMID 25519857. Archived from the original on 26 January 2017. ^ a b Wilson ML (2012). "Malaria rapid diagnostic tests". Clinical Infectious Diseases. 54 (11): 1637–41. doi: 10.1093/cid/cis228. PMID 22550113. ^ Perkins MD, Bell DR (2008). "Working without a blindfold: The critical role of diagnostics in malaria control". Malaria Journal. 1 (Suppl 1): S5. doi: 10.1186/1475-2875-7-S1-S5. PMC 2604880. PMID 19091039. ^ Sabot O, Cohen JM, Hsiang MS, Kahn JG, Basu S, Tang L, Zheng B, Gao Q, Zou L, Tatarsky A, Aboobakar S, Usas J, Barrett S, Cohen JL, Jamison DT, Feachem RG (2010). "Costs and financial feasibility of malaria elimination". Lancet. 376 (9752): 1604–15. doi: 10.1016/S0140-6736(10)61355-4. PMC 3044845. PMID 21035839. ^ Athuman, M; Kabanywanyi, AM; Rohwer, AC (13 January 2015). "Intermittent preventive antimalarial treatment for children with anaemia". The Cochrane Database of Systematic Reviews. 1: CD010767. doi: 10.1002/14651858.CD010767.pub2. PMC 4447115. PMID 25582096. ^ Lengeler C (2004). Lengeler, Christian (ed.). "Insecticide-treated bed nets and curtains for preventing malaria". Cochrane Database of Systematic Reviews (2): CD000363. doi: 10.1002/14651858.CD000363.pub2. PMID 15106149. ^ Tanser FC, Lengeler C, Sharp BL (2010). Lengeler C (ed.). "Indoor residual spraying for preventing malaria". Cochrane Database of Systematic Reviews (4): CD006657. doi: 10.1002/14651858.CD006657.pub2. PMID 20393950. ^ a b Raghavendra K, Barik TK, Reddy BP, Sharma P, Dash AP (2011). "Malaria vector control: From past to future". Parasitology Research. 108 (4): 757–79. doi: 10.1007/s00436-010-2232-0. PMID 21229263. ^ a b c Howitt P, Darzi A, Yang GZ, Ashrafian H, Atun R, Barlow J, Blakemore A, Bull AM, Car J, Conteh L, Cooke GS, Ford N, Gregson SA, Kerr K, King D, Kulendran M, Malkin RA, Majeed A, Matlin S, Merrifield R, Penfold HA, Reid SD, Smith PC, Stevens MM, Templeton MR, Vincent C, Wilson E (2012). "Technologies for global health". The Lancet. 380 (9840): 507–35. doi: 10.1016/S0140-6736(12)61127-1. PMID 22857974. ^ Miller JM, Korenromp EL, Nahlen BL, W Steketee R (2007). "Estimating the number of insecticide-treated nets required by African households to reach continent-wide malaria coverage targets". Journal of the American Medical Association. 297 (20): 2241–50. doi: 10.1001/jama.297.20.2241. PMID 17519414. ^ Noor AM, Mutheu JJ, Tatem AJ, Hay SI, Snow RW (2009). "Insecticide-treated net coverage in Africa: Mapping progress in 2000–07". Lancet. 373 (9657): 58–67. doi: 10.1016/S0140-6736(08)61596-2. PMC 2652031. PMID 19019422. ^ Enayati A, Hemingway J (2010). "Malaria management: Past, present, and future". Annual Review of Entomology. 55: 569–91. doi: 10.1146/annurev-ento-112408-085423. PMID 19754246. ^ a b van den Berg H (2009). "Global status of DDT and its alternatives for use in vector control to prevent disease". Environmental Health Perspectives. 117 (11): 1656–63. doi: 10.1289/ehp.0900785. PMC 2801202. PMID 20049114. ^ Pates H, Curtis C (2005). "Mosquito behaviour and vector control". Annual Review of Entomology. 50: 53–70. doi: 10.1146/annurev.ento.50.071803.130439. PMID 15355233. ^ Tusting LS, Thwing J, Sinclair D, Fillinger U, Gimnig J, Bonner KE, Bottomley C, Lindsay SW (2013). "Mosquito larval source management for controlling malaria". Cochrane Database of Systematic Reviews. 8: CD008923. doi: 10.1002/14651858.CD008923.pub2. PMC 4669681. PMID 23986463. ^ Enayati AA, Hemingway J, Garner P (2007). Enayati A (ed.). "Electronic mosquito repellents for preventing mosquito bites and malaria infection" (PDF). Cochrane Database of Systematic Reviews (2): CD005434. doi: 10.1002/14651858.CD005434.pub2. PMID 17443590. Archived from the original on 2016-05-03. ^ Lalloo DG, Olukoya P, Olliaro P (2006). "Malaria in adolescence: Burden of disease, consequences, and opportunities for intervention". Lancet Infectious Diseases. 6 (12): 780–93. doi: 10.1016/S1473-3099(06)70655-7. PMID 17123898. ^ Bardají A, Bassat Q, Alonso PL, Menéndez C (2012). "Intermittent preventive treatment of malaria in pregnant women and infants: making best use of the available evidence". Expert Opinion on Pharmacotherapy. 13 (12): 1719–36. doi: 10.1517/14656566.2012.703651. PMID 22775553. ^ Meremikwu MM, Donegan S, Sinclair D, Esu E, Oringanje C (2012). Meremikwu MM (ed.). "Intermittent preventive treatment for malaria in children living in areas with seasonal transmission". Cochrane Database of Systematic Reviews. 2 (2): CD003756. doi: 10.1002/14651858.CD003756.pub4. PMID 22336792. ^ a b Tickell-Painter, M; Maayan, N; Saunders, R; Pace, C; Sinclair, D (30 October 2017). "Mefloquine for preventing malaria during travel to endemic areas". The Cochrane Database of Systematic Reviews. 10: CD006491. doi: 10.1002/14651858.CD006491.pub4. PMC 5686653. PMID 29083100. ^ Freedman DO (2008). "Clinical practice. Malaria prevention in short-term travelers". New England Journal of Medicine. 359 (6): 603–12. doi: 10.1056/NEJMcp0803572. PMID 18687641. Archived from the original on 2012-04-22. ^ Fernando SD, Rodrigo C, Rajapakse S (2011). "Chemoprophylaxis in malaria: Drugs, evidence of efficacy and costs". Asian Pacific Journal of Tropical Medicine. 4 (4): 330–36. doi: 10.1016/S1995-7645(11)60098-9. PMID 21771482. ^ Radeva-Petrova, D; Kayentao, K; Ter Kuile, FO; Sinclair, D; Garner, P (10 October 2014). "Drugs for preventing malaria in pregnant women in endemic areas: any drug regimen versus placebo or no treatment". The Cochrane Database of Systematic Reviews. 10: CD000169. doi: 10.1002/14651858.CD000169.pub3. PMC 4498495. PMID 25300703. ^ Turschner S, Efferth T (2009). "Drug resistance in Plasmodium: Natural products in the fight against malaria". Mini Reviews in Medicinal Chemistry. 9 (2): 206–14. doi: 10.2174/138955709787316074. PMID 19200025. ^ Meremikwu MM, Odigwe CC, Akudo Nwagbara B, Udoh EE (2012). Meremikwu MM (ed.). "Antipyretic measures for treating fever in malaria". Cochrane Database of Systematic Reviews. 9: CD002151. doi: 10.1002/14651858.CD002151.pub2. PMID 22972057. ^ Kokwaro G (2009). "Ongoing challenges in the management of malaria". Malaria Journal. 8 (Suppl 1): S2. doi: 10.1186/1475-2875-8-S1-S2. PMC 2760237. PMID 19818169. ^ Keating GM (2012). "Dihydroartemisinin/piperaquine: A review of its use in the treatment of uncomplicated Plasmodium falciparum malaria". Drugs. 72 (7): 937–61. doi: 10.2165/11203910-000000000-00000. PMID 22515619. ^ Manyando C, Kayentao K, D'Alessandro U, Okafor HU, Juma E, Hamed K (2011). "A systematic review of the safety and efficacy of artemether-lumefantrine against uncomplicated Plasmodium falciparum malaria during pregnancy". Malaria Journal. 11: 141. doi: 10.1186/1475-2875-11-141. PMC 3405476. PMID 22548983. ^ O'Brien C, Henrich PP, Passi N, Fidock DA (2011). "Recent clinical and molecular insights into emerging artemisinin resistance in Plasmodium falciparum". Current Opinion in Infectious Diseases. 24 (6): 570–77. doi: 10.1097/QCO.0b013e32834cd3ed. PMC 3268008. PMID 22001944. ^ Fairhurst RM, Nayyar GM, Breman JG, Hallett R, Vennerstrom JL, Duong S, Ringwald P, Wellems TE, Plowe CV, Dondorp AM (2012). "Artemisinin-resistant malaria: research challenges, opportunities, and public health implications". American Journal of Tropical Medicine and Hygiene. 87 (2): 231–41. doi: 10.4269/ajtmh.2012.12-0025. PMC 3414557. PMID 22855752. ^ Rajapakse, Senaka; Rodrigo, Chaturaka; Fernando, Sumadhya Deepika (29 April 2015). "Tafenoquine for preventing relapse in people with Plasmodium vivax malaria". Cochrane Database of Systematic Reviews. 4: CD010458. doi: 10.1002/14651858.cd010458.pub2. PMC 4468925. PMID 25921416. Archived from the original on 26 January 2017. ^ Kochar, DK; Saxena, V; Singh, N; Kochar, SK; Kumar, SV; Das, A (January 2005). "Plasmodium vivax malaria". Emerging Infectious Diseases. 11 (1): 132–34. doi: 10.3201/eid1101.040519. PMC 3294370. PMID 15705338. ^ Pasvol, G (2005). "The treatment of complicated and severe malaria". British Medical Bulletin. 75–76: 29–47. doi: 10.1093/bmb/ldh059. PMID 16495509. ^ Idro, R; Marsh, K; John, CC; Newton, CR (October 2010). "Cerebral malaria: mechanisms of brain injury and strategies for improved neurocognitive outcome". Pediatric Research. 68 (4): 267–74. doi: 10.1203/pdr.0b013e3181eee738. PMC 3056312. PMID 20606600. ^ Sinclair D, Donegan S, Isba R, Lalloo DG (2012). Sinclair D (ed.). "Artesunate versus quinine for treating severe malaria". Cochrane Database of Systematic Reviews. 6: CD005967. doi: 10.1002/14651858.CD005967.pub4. PMID 22696354. ^ Kyu, Hmwe Hmwe; Fernández, Eduardo (2009). "Artemisinin derivatives versus quinine for cerebral malaria in African children: a systematic review". Bulletin of the World Health Organization. 87: 896–904. doi: 10.2471/BLT.08.060327. PMC 2789363. PMID 20454480. Archived from the original on 2016-03-04. ^ Sinha, Shweta; Medhi, Bikash; Sehgal, Rakesh (2014). "Challenges of drug-resistant malaria". Parasite. 21: 61. doi: 10.1051/parasite/2014059. PMC 4234044. PMID 25402734. ^ White NJ (2008). "Qinghaosu (artemisinin): The price of success". Science. 320 (5874): 330–34. doi: 10.1126/science.1155165. PMID 18420924. ^ Wongsrichanalai C, Meshnick SR (2008). "Declining artesunate-mefloquine efficacy against falciparum malaria on the Cambodia–Thailand border". Emerging Infectious Diseases. 14 (5): 716–19. doi: 10.3201/eid1405.071601. PMC 2600243. PMID 18439351. Archived from the original on 2010-03-09. ^ Dondorp AM, Yeung S, White L, Nguon C, Day NP, Socheat D, von Seidlein L (2010). "Artemisinin resistance: Current status and scenarios for containment". Nature Reviews Microbiology. 8 (4): 272–80. doi: 10.1038/nrmicro2331. PMID 20208550. ^ Ashley EA, Dhorda M, Fairhurst RM, Amaratunga C, Lim P, et al. (2014). "Spread of artemisinin resistance in Plasmodium falciparum malaria". New England Journal of Medicine. 371 (5): 411–23. doi: 10.1056/NEJMoa1314981. PMC 4143591. PMID 25075834. ^ Trampuz A, Jereb M, Muzlovic I, Prabhu R (2003). "Clinical review: Severe malaria". Critical Care. 7 (4): 315–23. doi: 10.1186/cc2183. PMC 270697. PMID 12930555. ^ a b c d Fernando SD, Rodrigo C, Rajapakse S (2010). "The 'hidden' burden of malaria: Cognitive impairment following infection". Malaria Journal. 9: 366. doi: 10.1186/1475-2875-9-366. PMC 3018393. PMID 21171998. ^ Riley EM, Stewart VA (2013). "Immune mechanisms in malaria: New insights in vaccine development". Nature Medicine. 19 (2): 168–78. doi: 10.1038/nm.3083. PMID 23389617. ^ a b Idro R, Marsh K, John CC, Newton CR (2010). "Cerebral malaria: Mechanisms of brain injury and strategies for improved neuro-cognitive outcome". Pediatric Research. 68 (4): 267–74. doi: 10.1203/PDR.0b013e3181eee738. PMC 3056312. PMID 20606600. ^ Olupot-Olupot P, Maitland, K (2013). "Management of severe malaria: Results from recent trials". Advances in Experimental Medicine and Biology. Advances in Experimental Medicine and Biology. 764: 241–50. doi: 10.1007/978-1-4614-4726-9_20. ISBN 978-1-4614-4725-2. PMID 23654072. ^ a b Murray CJ, Rosenfeld LC, Lim SS, Andrews KG, Foreman KJ, Haring D, Fullman N, Naghavi M, Lozano R, Lopez AD (2012). "Global malaria mortality between 1980 and 2010: A systematic analysis". Lancet. 379 (9814): 413–31. doi: 10.1016/S0140-6736(12)60034-8. PMID 22305225. ^ Bhatt, S.; J. Weiss, D.; Cameron, E.; Bisanzio, D.; Mappin, B.; Dalrymple, U.; Battle, K.E. ; Moyes, C.L. ; Henry, A.; Eckhoff, P.A. ; Wenger, E.A. ; Briët, O.; Penny, M.A. ; Smith, T.A. ; Bennett, A.; Yukich, J.; Eisele, T.P. ; Griffin, J.T. ; A. Fergus, C.; Lynch, M.; Lindgren, F.; Cohen, J.M. ; Murray, C.L.J. ; Smith, D.L. ; Hay, S.I. ; Cibulskis, R.E. ; Gething, P.W. (16 September 2015). "The effect of malaria control on Plasmodium falciparum in Africa between 2000 and 2015". Nature. 526 (7572): 207–11. doi: 10.1038/nature15535. PMC 4820050. PMID 26375008. Archived from the original on 7 October 2015. ^ a b Guerra CA, Hay SI, Lucioparedes LS, Gikandi PW, Tatem AJ, Noor AM, Snow RW (2007). "Assembling a global database of malaria parasite prevalence for the Malaria Atlas Project". Malaria Journal. 6 (1): 17. doi: 10.1186/1475-2875-6-17. 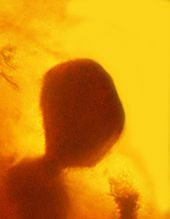 PMC 1805762. PMID 17306022. ^ Hay SI, Okiro EA, Gething PW, Patil AP, Tatem AJ, Guerra CA, Snow RW (2010). Mueller I (ed.). "Estimating the global clinical burden of Plasmodium falciparum malaria in 2007". PLoS Medicine. 7 (6): e1000290. doi: 10.1371/journal.pmed.1000290. PMC 2885984. PMID 20563310. ^ Gething PW, Patil AP, Smith DL, Guerra CA, Elyazar IR, Johnston GL, Tatem AJ, Hay SI (2011). "A new world malaria map: Plasmodium falciparum endemicity in 2010". Malaria Journal. 10 (1): 378. doi: 10.1186/1475-2875-10-378. PMC 3274487. PMID 22185615. Archived from the original on 2012-04-07. ^ Feachem RG, Phillips AA, Hwang J, Cotter C, Wielgosz B, Greenwood BM, Sabot O, Rodriguez MH, Abeyasinghe RR, Ghebreyesus TA, Snow RW (2010). "Shrinking the malaria map: progress and prospects". Lancet. 376 (9752): 1566–78. doi: 10.1016/S0140-6736(10)61270-6. PMC 3044848. PMID 21035842. ^ Greenwood B, Mutabingwa T (2002). "Malaria in 2002". Nature. 415 (6872): 670–72. doi: 10.1038/415670a. PMID 11832954. ^ Abeku TA (2007). "Response to malaria epidemics in Africa". Emerging Infectious Diseases. 13 (5): 681–86. doi: 10.3201/eid1305.061333. PMC 2738452. PMID 17553244. ^ Cui L, Yan G, Sattabongkot J, Cao Y, Chen B, Chen X, Fan Q, Fang Q, Jongwutiwes S, Parker D, Sirichaisinthop J, Kyaw MP, Su XZ, Yang H, Yang Z, Wang B, Xu J, Zheng B, Zhong D, Zhou G (2012). "Malaria in the Greater Mekong Subregion: Heterogeneity and complexity". Acta Tropica. 121 (3): 227–39. doi: 10.1016/j.actatropica.2011.02.016. PMC 3132579. PMID 21382335. ^ Machault V, Vignolles C, Borchi F, Vounatsou P, Pages F, Briolant S, Lacaux JP, Rogier C (2011). "The use of remotely sensed environmental data in the study of malaria" (PDF). Geospatial Health. 5 (2): 151–68. doi: 10.4081/gh.2011.167. PMID 21590665. Archived from the original (PDF) on 2013-03-12. ^ Harper K, Armelagos G (2011). "The changing disease-scape in the third epidemiological transition". International Journal of Environmental Research and Public Health. 7 (2): 675–97. doi: 10.3390/ijerph7020675. PMC 2872288. PMID 20616997. ^ Prugnolle F, Durand P, Ollomo B, Duval L, Ariey F, Arnathau C, Gonzalez JP, Leroy E, Renaud F (2011). Manchester M (ed.). "A fresh look at the origin of Plasmodium falciparum, the most malignant malaria agent". PLoS Pathogens. 7 (2): e1001283. doi: 10.1371/journal.ppat.1001283. PMC 3044689. PMID 21383971. ^ Cox F (2002). "History of human parasitology". Clinical Microbiology Reviews. 15 (4): 595–612. doi: 10.1128/CMR.15.4.595-612.2002. PMC 126866. PMID 12364371. ^ Sallares R (2002). Malaria and Rome: A History of Malaria in Ancient Italy. Oxford University Press. doi: 10.1093/acprof:oso/9780199248506.001.0001. ISBN 978-0-19-924850-6. ^ Reiter, P (1999). "From Shakespeare to Defoe: malaria in England in the Little Ice Age". Emerging Infectious Diseases. 6 (1): 1–11. doi: 10.3201/eid0601.000101. PMC 2627969. PMID 10653562. ^ Kaufman TS, Rúveda EA (2005). "The quest for quinine: Those who won the battles and those who won the war". Angewandte Chemie International Edition in English. 44 (6): 854–85. doi: 10.1002/anie.200400663. PMID 15669029. ^ Kyle R, Shampe M (1974). "Discoverers of quinine". Journal of the American Medical Association. 229 (4): 462. doi: 10.1001/jama.229.4.462. PMID 4600403. ^ Achan J, Talisuna AO, Erhart A, Yeka A, Tibenderana JK, Baliraine FN, Rosenthal PJ, D'Alessandro U (2011). "Quinine, an old anti-malarial drug in a modern world: Role in the treatment of malaria". Malaria Journal. 10 (1): 144. doi: 10.1186/1475-2875-10-144. PMC 3121651. PMID 21609473. Archived from the original on 2012-02-26. ^ Hsu E (2006). "Reflections on the 'discovery' of the antimalarial qinghao". British Journal of Clinical Pharmacology. 61 (3): 666–70. doi: 10.1111/j.1365-2125.2006.02673.x. PMC 1885105. PMID 16722826. ^ Vogel V (2013). "Malaria as a lifesaving therapy". Science. 342 (6159): 684–87. doi: 10.1126/science.342.6159.684. ^ Killeen G, Fillinger U, Kiche I, Gouagna L, Knols B (2002). "Eradication of Anopheles gambiae from Brazil: Lessons for malaria control in Africa?". Lancet Infectious Diseases. 2 (10): 618–27. doi: 10.1016/S1473-3099(02)00397-3. PMID 12383612. ^ Vanderberg JP (2009). "Reflections on early malaria vaccine studies, the first successful human malaria vaccination, and beyond". Vaccine. 27 (1): 2–9. doi: 10.1016/j.vaccine.2008.10.028. PMC 2637529. PMID 18973784. ^ Sachs J, Malaney P (2002). "The economic and social burden of malaria". Nature. 415 (6872): 680–85. doi: 10.1038/415680a. PMID 11832956. ^ Ricci F (2012). "Social implications of malaria and their relationships with poverty". Mediterranean Journal of Hematology and Infectious Diseases. 4 (1): e2012048. doi: 10.4084/MJHID.2012.048. PMC 3435125. PMID 22973492. ^ Lon CT, Tsuyuoka R, Phanouvong S, Nivanna N, Socheat D, Sokhan C, Blum N, Christophel EM, Smine A (2006). "Counterfeit and substandard antimalarial drugs in Cambodia". Transactions of the Royal Society of Tropical Medicine and Hygiene. 100 (11): 1019–24. doi: 10.1016/j.trstmh.2006.01.003. PMID 16765399. ^ Newton PN, Fernández FM, Plançon A, Mildenhall DC, Green MD, Ziyong L, Christophel EM, Phanouvong S, Howells S, McIntosh E, Laurin P, Blum N, Hampton CY, Faure K, Nyadong L, Soong CW, Santoso B, Zhiguang W, Newton J, Palmer K (2008). "A collaborative epidemiological investigation into the criminal fake artesunate trade in South East Asia". PLoS Medicine. 5 (2): e32. doi: 10.1371/journal.pmed.0050032. PMC 2235893. PMID 18271620. ^ Newton PN, Green MD, Fernández FM, Day NP, White NJ (2006). "Counterfeit anti-infective drugs". Lancet Infectious Diseases. 6 (9): 602–13. doi: 10.1016/S1473-3099(06)70581-3. PMID 16931411. ^ Parry J (2005). "WHO combats counterfeit malaria drugs in Asia". British Medical Journal. 330 (7499): 1044. doi: 10.1136/bmj.330.7499.1044-d. PMC 557259. PMID 15879383. ^ Gautam CS, Utreja A, Singal GL (2009). "Spurious and counterfeit drugs: A growing industry in the developing world". Postgraduate Medical Journal. 85 (1003): 251–56. doi: 10.1136/pgmj.2008.073213. PMID 19520877. ^ Caudron JM, Ford N, Henkens M, Macé, Kidle-Monroe R, Pinel J (2008). "Substandard medicines in resource-poor settings: A problem that can no longer be ignored" (PDF). Tropical Medicine & International Health. 13 (8): 1062–72. doi: 10.1111/j.1365-3156.2008.02106.x. PMID 18631318. ^ Nayyar GM, Breman JG, Newton PN, Herrington J (2012). "Poor-quality antimalarial drugs in southeast Asia and sub-Saharan Africa". Lancet Infectious Diseases. 12 (6): 488–96. doi: 10.1016/S1473-3099(12)70064-6. PMID 22632187. ^ Williams LL (1963). "Malaria eradication in the United States". American Journal of Public Health and the Nation's Health. 53 (1): 17–21. doi: 10.2105/AJPH.53.1.17. PMC 1253858. PMID 14000898. ^ Hall, B. Fenton; Fauci, Anthony S. (2009-12-01). "Malaria Control, Elimination, and Eradication: The Role of the Evolving Biomedical Research Agenda". Journal of Infectious Diseases. 200 (11): 1639–43. doi: 10.1086/646611. PMID 19877843. ^ Hill AVS (2011). "Vaccines against malaria". Philosophical Transactions of the Royal Society B. 366 (1579): 2806–14. doi: 10.1098/rstb.2011.0091. PMC 3146776. PMID 21893544. ^ Crompton PD, Pierce SK, Miller LH (2010). "Advances and challenges in malaria vaccine development". Journal of Clinical Investigation. 120 (12): 4168–78. doi: 10.1172/JCI44423. PMC 2994342. PMID 21123952. ^ Graves P, Gelband H (2006). Graves PM (ed.). "Vaccines for preventing malaria (blood-stage)". Cochrane Database of Systematic Reviews (4): CD006199. doi: 10.1002/14651858.CD006199. PMID 17054281. ^ Graves P, Gelband H (2006). Graves PM (ed.). "Vaccines for preventing malaria (SPf66)". Cochrane Database of Systematic Reviews (2): CD005966. doi: 10.1002/14651858.CD005966. PMID 16625647. ^ Kalanon M, McFadden GI (2010). "Malaria, Plasmodium falciparum and its apicoplast". Biochemical Society Transactions. 38 (3): 775–82. doi: 10.1042/BST0380775. PMID 20491664. ^ Müller IB, Hyde JE, Wrenger C (2010). "Vitamin B metabolism in Plasmodium falciparum as a source of drug targets". Trends in Parasitology. 26 (1): 35–43. doi: 10.1016/j.pt.2009.10.006. PMID 19939733. ^ Du Q, Wang H, Xie J (2011). "Thiamin (vitamin B1) biosynthesis and regulation: A rich source of antimicrobial drug targets?". International Journal of Biological Sciences. 7 (1): 41–52. doi: 10.7150/ijbs.7.41. PMC 3020362. PMID 21234302. ^ Biot C, Castro W, Botté CY, Navarro M (2012). "The therapeutic potential of metal-based antimalarial agents: Implications for the mechanism of action". Dalton Transactions. 41 (21): 6335–49. doi: 10.1039/C2DT12247B. PMID 22362072. ^ Roux C, Biot C (2012). "Ferrocene-based antimalarials". Future Medicinal Chemistry. 4 (6): 783–97. doi: 10.4155/fmc.12.26. PMID 22530641. ^ Aultman KS, Gottlieb M, Giovanni MY, Fauci AS (2002). "Anopheles gambiae genome: completing the malaria triad". Science. 298 (5591): 13. doi: 10.1126/science.298.5591.13. PMID 12364752. ^ Ito J, Ghosh A, Moreira LA, Wimmer EA, Jacobs-Lorena M (2002). "Transgenic anopheline mosquitoes impaired in transmission of a malaria parasite". Nature. 417 (6887): 452–55. doi: 10.1038/417452a. PMID 12024215. ^ Gantz, Valentino M.; Jasinskiene, Nijole; Tatarenkova, Olga; Fazekas, Aniko; Macias, Vanessa M.; Bier, Ethan; James, Anthony A. (23 November 2015). "Highly efficient Cas9-mediated gene drive for population modification of the malaria vector mosquito". Proceedings of the National Academy of Sciences. 112: 201521077. doi: 10.1073/pnas.1521077112. PMC 4679060. PMID 26598698. Archived from the original on 27 November 2015. Retrieved 24 November 2015. ^ Baird JK. (2009). "Malaria zoonoses". Travel Medicine and Infectious Disease. 7 (5): 269–77. doi: 10.1016/j.tmaid.2009.06.004. PMID 19747661. ^ Ameri M (2010). "Laboratory diagnosis of malaria in nonhuman primates". Veterinary Clinical Pathology. 39 (1): 5–19. doi: 10.1111/j.1939-165X.2010.00217.x. PMID 20456124. ^ Mlambo G, Kumar N (2008). "Transgenic rodent Plasmodium berghei parasites as tools for assessment of functional immunogenicity and optimization of human malaria vaccines". Eukaryotic Cell. 7 (11): 1875–79. doi: 10.1128/EC.00242-08. PMC 2583535. PMID 18806208. ^ Lapointe DA, Atkinson CT, Samuel MD (2012). "Ecology and conservation biology of avian malaria". Annals of the New York Academy of Sciences. 1249: 211–26. doi: 10.1111/j.1749-6632.2011.06431.x. PMID 22320256.